The Social Justice Task Force works to initiate, promote and support social justice action in our Diocese. Raising diocesan and community awareness of social justice issues. 1. Recognises with profound regret that some theological interpretations of scripture have enshrined an understanding of family which has on occasion legitimized violence against women and children by concepts of ownership and headship. A small group will be working on this with the intention of further resourcing us so that we can take up the initiatives in this motion. Download a copy of the Diocesan Domestic Violence Poster for your church or organisation. 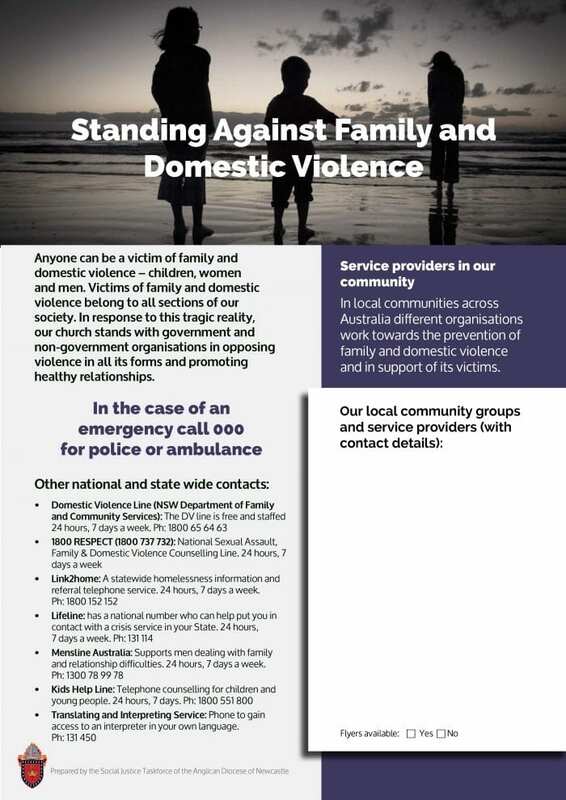 Download a copy of the Domestic Violence DL Brochure for your church or organisation. The Awabakal, Biripi, Darkinjung, Geawegal, Kamilaroi, Worimi and Wonnarua peoples are recognised as the traditional custodians of the areas of the Anglican Diocese of Newcastle. Read more about why the Anglican Diocese of Newcastle supports reconciliation. I would like to show my respect and acknowledge the Traditional Custodians of the Land, of Elders past and present, on which this meeting takes place. Into the full day which has dawned in Jesus Christ. Amen. HOW CAN YOU CELEBRATE NATSIAC IN YOUR CHURCH OR COMMUNITY? The Anglican Diocese of Newcastle aims to seek justice and compassion for all those who are seeking asylum in Australia. Churches across the Diocese aim to raise awareness of the plight of asylum seekers and generate an empathetic response to what has become a divisive and contentious issue across our nation. Churches across the Diocese aim to raise awareness of the plight of asylum seekers and generate an empathetic response to what has become a divisive and contentious issue across our nation. Every asylum seeker has a face, a name, a story. It’s important to highlight the need to show more compassion towards each individual and encourage the community and the government to rethink how we currently treat asylum seekers. This right may not be invoked in the case of prosecutions genuinely arising from non-political crimes or from acts contrary to the purpose and principles of the United Nations.